The cast of “Snow White & the Seven Dwarfs” performed at St. Clair Memorial Hall. 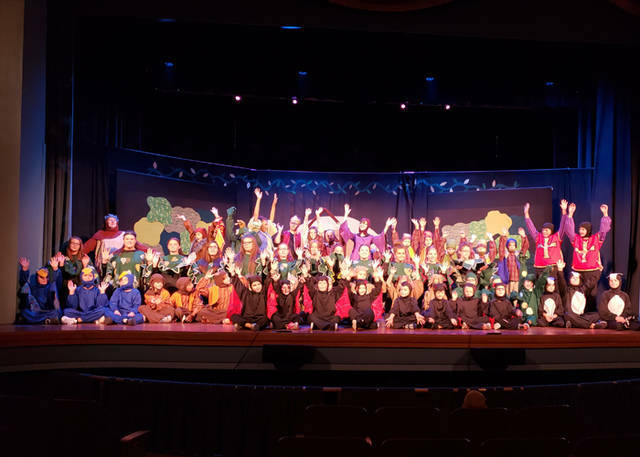 In one short week the Missoula directors cast, rehearsed and presented the musical “Snow White & the Seven Dwarfs,” featuring 60 local students from grades 1-12 in roles from the familiar tale with a Missoula Theatre twist. On Aug. 4 the cast performed two productions at St. Clair Memorial Hall for a delighted audience. The purpose of Darke County Endowment for the Arts is to keep the arts alive forever in the community. Darke County Endowment for the Arts is a non-profit organization that receives and manages charitable gifts, which are invested to produce income to benefit the Arts in Darke County. The endowment assists donors in fulfilling their charitable wishes, creating lasting legacies to enrich lives through the arts for years to come. Darke County Endowment for the Arts is managed by a Board of Trustees made who meet regularly to manage investments and consider appropriate action to assist the arts in Darke County as funds are available. Current trustees are Gary Brown, Marilyn Delk, Roberta Feltman, Barbara Greiner, Becky Hartnagle and Andrea Jordan; Nicki Gillespie serves as treasurer. For more information or to make a donation to the Darke County Endowment for the Arts, visit www.SupportDCEA.org or P.O. Box 155, Greenville, OH 45331. “Snow White & the Seven Dwarfs” was also made possible thanks to the Ohio Arts Council, local foundations and DCCA memberships. For more information on Darke County Center for the Arts, contact the DCCA office at 547-0908 or visit www.DarkeCountyArts.org.